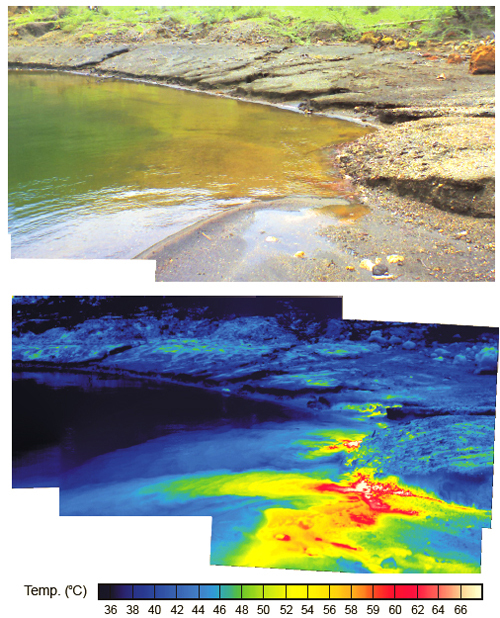 U. TEXAS-AUSTIN (US) — Scientists have discovered a new type of hot spring, a “terrestrial smoker,” along the banks of a volcanic lake in the Philippines. These “terrestrial smokers” are cousins to submarine black smokers, hydrothermal vents on the seafloor that spew plumes of hot, nutrient-rich water and often support rich communities of life. Terrestrial smokers might represent a missing piece of the heat budgets for many active volcanoes around the world. Getting those budgets right might help scientists better predict the size and timing of future eruptions. And because of their unique chemical properties, the springs might harbor life forms new to science. The team, led by Bayani Cardenas, associate professor in the Jackson School of Geosciences at the University of Texas at Austin, discovered the springs along the banks of a crater lake inside the still active Taal Volcano, about 31 miles from Manila. Cardenas speculates that terrestrial smokers may exist in many other parts of the world where bodies of cool surface water sit atop geothermal sources, for example in rivers at Yellowstone National Park and the Newberry caldera in Oregon. Based on their observations and computer simulations, the researchers conclude that cool lake water seeps into the lake bed near the shore, mixes with hot, shallow groundwater, and then rises back to the surface in a loop or convection cell. The water coming out of the spring flows underground at a rate of hundreds of meters per day, as compared to about a third of a meter per day for water in the High Plains of the central United States. So much lake water is cycled through these convective cells that the entire contents of the lake are recycled in a matter of days. Scientists have theorized the existence of such convective cells, but this is the first direct evidence of their existence. As reported in the journal Geophysical Research Letters, the spring water emerges at up to 60 degrees Celsius (140 degrees Fahrenheit), yet the springs are invisible to the unaided eye. Yet in infrared video, chaotic plumes of red and yellow swirl and push out into a field of blue. The lake water is fairly acidic (with a pH of about 2 or 3) and the groundwater is only slightly acidic (pH of about 5). The two mix over a very short distance to form spring water. “And when you have large pH contrasts like that, and metals and nutrients dissolved in the water, there are often lots of interesting things happening with bacteria there,” says Cardenas.